Sending a thesis draft to your supervisors is always a bit scary. When you’ve invested your time, brainpower, and soul into a piece of writing, it’s hard to submit it to someone else’s critical eye – not to mention their red pen. Tell your supervisor/s what kind of feedback you need. Before you submit a draft for review, think about the kind of feedback you want and need on this particular draft. Maybe you need a second opinion on the scope and phrasing of your research questions. Maybe you don’t feel confident in your use of English language. Maybe you’re unsure of how to structure a particular section. Whatever it is that you need help with, tell your supervisor. That way, you can give yourself the best chance of getting helpful feedback (and make the best use of your supervisor’s time). 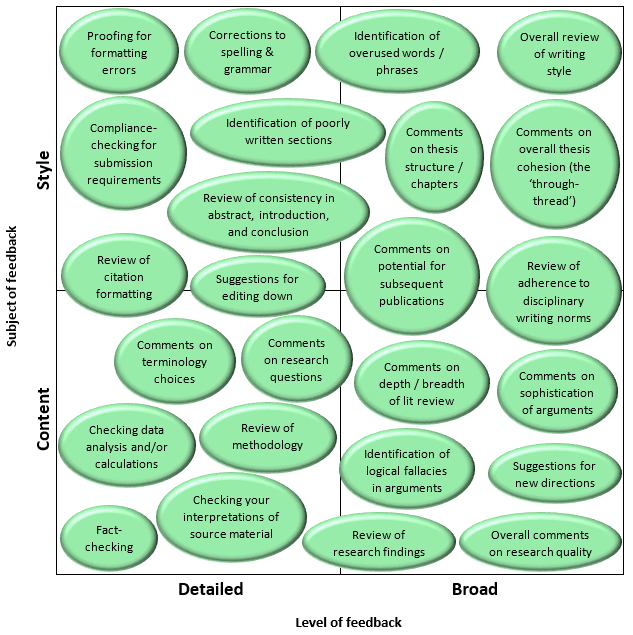 At different stages in the thesis-writing process, different types of feedback will be more useful. If you’re just starting to draft your thesis, for instance, you might want broad feedback on your content; whereas if you’re polishing a near-final draft, you might prefer detailed feedback on your style. Bear in mind that no single reader can be expected to give every type of feedback. Supervisors vary in the kind of feedback they like (or are willing, or able) to give. Some supervisors will get right down into the nitty-gritty. Others are big-picture thinkers. Some are obsessed with style; others with content. There might be a bit of trial and error in the process of learning about your supervisors’ preferred feedback styles. (Of course, you could ask them!) But once you get to know how your supervisors review your drafts, you may find that the members of your supervisory team have different – and hopefully complementary – strengths. You may also find that the type of feedback you want is best given by someone outside your supervisory team. For example, many types of stylistic feedback can be given by a professional proofreader or a specialist writing advisor. Supervisors are also not responsible for checking every single fact and calculation – you may like to peer review with another student if you’re looking for more attention than your supervisors can give in that regard. The point of all this is to make the best use of everybody’s time and energy, so don’t be afraid to speak up for what you need.